American Tourister Giveaway | A Savings WOW! Planning a getaway for Spring Break or for the summer? Would you like some new luggage to get you there in style? Enter to win American Tourister luggage. The American Tourister DeLITE 3 and Aerospin suitcases are EXCLUSIVELY available at Target. 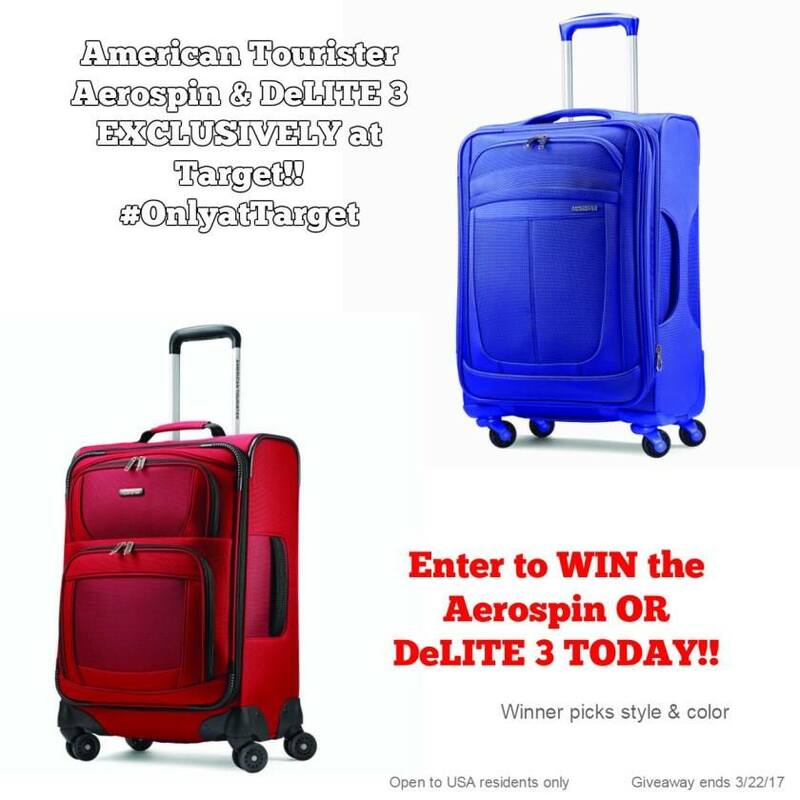 Winner’s Choice – American Tourister Aerospin OR DeLITE 3, winner picks color! Disclaimer: Giveaway open to US, 18+ entrants only. Giveaway ends 3/22/17 at 11:59 pm EST. Come back daily for more chances to win. The participating bloggers were not compensated for this post. We are not associated with any of the companies named above. No purchase is necessary to enter. Void where prohibited by law. The odds of winning are based on the number of entries received Open to USA, 18+ only. Limit one entrant per household. Confirmed Winner(s) (by Random.org) will be contacted by email. Winner(s) have 48 hours to respond before a new winner is chosen. No purchase necessary. Void where prohibited by law. The sponsor(s) will be responsible for product shipment to winner(s) of this giveaway. My blog is not responsible for product shipment/delivery. This event is in no way administered, sponsored, or endorsed by, or associated with, Facebook and/or Twitter, Google, Pinterest, Instagram or Klout. This disclosure is done in accordance with the Federal Trade Commission 10 CFR, Part 255 Guides Concerning the Use of Endorsements. Entrants must only enter with either one email address, IP address and/or Facebook account, anyone found violating these rules will be disqualified. It is at the sole discretion of the admin of the giveaway if the winner has met the rules or not. I would love to have a several pieces of their luggage. One item is the American Tourister Triumph DLX 25″ Spinner. I need a larger piece of luggage than the one I have and I love the spinner wheels. I like to get the American Tourister Skylite 24″ Spinner in black/blue. Thanks! Please delete the last entry “bonus entry – complete daily”. I was trying to complete the email sub for africa’s blog and entered into the wrong space. I don’t know what the entry requirement listed for the “bonus entry – complete daily”. So sorry, thanks! I like the disney backpack. I would really like to get my granddaughter the American Tourister Disney 18″ Hardside Upright with Minnie Mouse — super cute! Item NO. : 747274451 is awesome. I am a huge minny mouse fan so this is great. My choice is the American Tourister Pop Plus 3 Piece Set in teal. Thank you for the giveaway! I like them all but picked AMERICAN TOURISTER STAR WARS 28″ SPINNER. This luggage would be awesome to have,I go out of town once a month,and visit my dad in Florida when I can. I like the Finding Dory American Tourister Disney Backpack. I really like the American Tourister Cube Pop 31″ Spinner. I’ve been wanting to get a hard sided suitcase. The Kids Finding Dory case is super cute. We like the American Tourister Star Wars 28″ Spinner !! !